Yay! We made it through Thanksgiving! We don’t have to just survive the holidays. There are skills and perspectives that can help us sail through the holidays with ease and enjoyment. Survival is not our goal. Thriving by creating and maintaining positive relationships and perspectives is what we want to strive for during the holiday season. It is so much more fun and motivating that just slogging through! Let’s make the holidays joyous! Judging people, events, and things uses up a lot of emotional energy. When we judge something or someone in a negative way, we are activating powerful, negative emotions. These emotions can be even more powerful if we’ve been having them for a long time. For example, Aunt Agnes has run her mouth for years about how a woman’s place is in the home. Trigger alert! 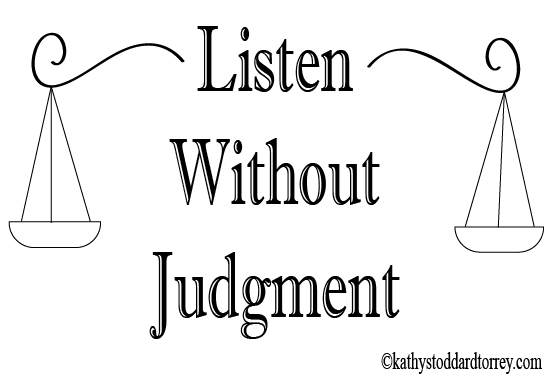 We listen, judge, attach a whole host of negative emotions, and fume. Sometimes we skip the “listen” stage and complete the rest of the sequence before she has finished intaking breath to speak. It’s all exhausting. It’s important to accept that we are never going to change Aunt Agnes’ view of a woman’s place. Never. It’s also important to know that we aren’t going to change our minds or change who we are if we listen to her point of view. She isn’t a hypnotist or a wizard who can make us change our thinking if we don’t want to do so. By keeping those two things in mind, we can change the dynamic of our conversations with Aunt Agnes by listening to her without judgment. First, we want to adopt a curious perspective. Let’s commit to asking her at least three questions. Why does she feel that way? What experiences has she had that influence her thinking? How is she trying to protect you in her view? Most of our internal and external critics are trying to protect us from something. It’s fascinating to figure out what those things are. In order to have this conversation, we need to put our egos in a chair in another room. Then, we need to lock the door so they can’t come in and take over the conversation. Seriously, our egos gets in the way of truly listening without judgment all the time. It can feel insulting to hear someone say that you just don’t have the DNA to handle a difficult job or understand technology. Refer back to the fact that Aunt Agnes is not a master of mind control. She can’t hurt you. She can’t make you less than who you are. She also can’t make things true by saying them out loud. When your ego starts yelling from the other room, shout back that you got this. A conversation with Aunt Agnes is a great opportunity to practice some conversational jiu-jitsu. We never want to meet force with force in a conversation. If someone starts yelling, it isn’t effective for us to start yelling back. We want to stay calm and ask questions. Nothing takes the wind out of someone’s anger sails faster than calmly asking them to explain what makes this issue such a hot topic. Our personal needs are to be listened to, understood, and respected. We create positive relationships with people when we make them feel heard and respected. We can give Aunt Agnes and everyone else that we talk to a wonderful gift this holiday season if we listen to them calmly without judgment. 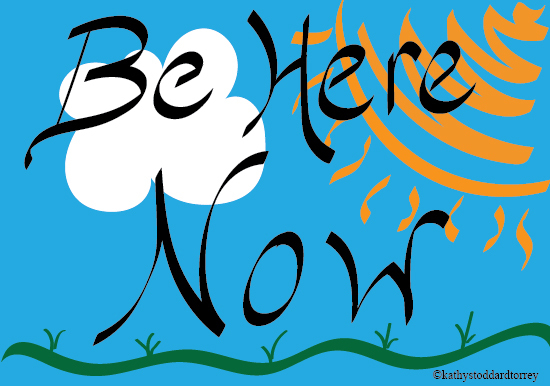 Skill 1: Be here now. We spend a lot of time being frantic during the holidays. We worry about getting the decorations up, buying presents, preparing food, traveling, and interacting with our families. When we worry or stress, we are thinking about the future or the past. We remember past holidays that didn’t go according to plan. We stress about the bills to come. We dread conversations with Uncle Seibert who doesn’t share our values or world view. The best antidote for stress and worry is to concentrate on being in the moment. When we are fully present in the now, we aren’t worrying about the past or the future. We are noticing our surroundings and embracing our feelings. We are paying close attention to the people who are with us. When we live fully in the moment, there isn’t a space for worrying about other things. We are capable of only doing one thing at a time. Multitasking has gotten a lot of hype, and interviewers still ask job candidates if they can multitask. However, studies show that the answer to that question is no. None of us can pay attention to more than one thing at a time. We can become adept at switching between things, but there is always a loss in concentration and time when we continually switch between tasks or thoughts. Think about it for a minute. Let’s say I sit down to write notes on Christmas cards, but then start running my to-do list through my head. In reality, I’m sitting at the table doing nothing. I’m not getting the Christmas cards done, and I’m not checking things off of my to-do list. I am doing nothing! In order to be in the moment, we need to be confident that what we are doing is what we need and want to be doing. That takes some organization and prioritization. We need to make a list, check it twice, and then decide what three things we want to accomplish each day. Once we identify what’s important, all we have to do is buckle down and focus on getting those tasks done one at a time. It’s good to have a to-do list for home and work. Our goal is to know that what we are doing is what we need to be doing while focusing on that task completely. We have daily chores, too. We drive kids around, shop for groceries, and we take showers. These are prime times to worry and stress. Focusing on what’s going on in the present keeps us calm and gives our tired brains a break. Remember, showering while stressing over getting everything done isn’t helping you get everything done. Take a moment to feel the water on your skin, smell the soap, and relax your muscles in the warm water. Focusing on the now is being mindful. Studies show that no matter what we are doing, we are happier if we are doing it mindfully – really paying attention to what is going on now. Going about our holiday activities in a mindful way will help reduce stress and increase the joy that you feel!